Area 253 Glassblowing holds classes for beginner, intermediate, and advanced glassblowers, taught by glass professionals from around the country. Students are required to wear all natural fibers (cotton, linen, silk, etc.) and closed toe shoes, long hair needs to be contained and bring along a sketchbook for notes. Students are also required to wear eye protection (either sunglasses or safety glasses) during the classes. If you do not have sunglasses a pair of safety glasses will be provided for you. This class is provided with 2 options one being four-week class and the other being a 2 day (6 hour per day) workshop. This class begins with the basics and introduces students to paperweights and basic vessels using a hands-on approach. 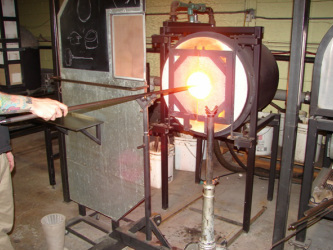 Students will become comfortable with glass shop equipment, glass gathering, simple vessel blowing, and safety. This course is provided with 2 options one being four-week class and the other being a 2 day (6 hour per day) workshop. This course is designed to hone skills introduced in beginning glassblowing and add a few new techniques, such as color application. Successful graduates of this course are eligible to work independently at Area 253. This course is provided with 2 options one being four-week class and the other being a 2 day (6 hour per day) workshop. This course is designed to hone skills learned in beginning and intermediate glassblowing and learn new techniques. Successful graduates of this course are eligible to work independently at Area 253. Private glassblowing lessons with a professional glassblower are always available and can be scheduled for a time that’s convenient to you. Whether you want to make a certain project or have an exciting glassblowing adventure; we can custom design your lesson to meet your glass goals. All equipment and materials are included. This three hour class is designed to give students an introduction to beadmaking. This two-day class, with 4 hours each session, is designed to teach students the basic techniques into flamework beadmaking mandrel-wound glass on a small torch. We will discuss studio set-up, terminology of glass, equipment, safety, and tools. You will learn how to make a bead from dipping the mandrel to laying various designs. There will be demonstrations throughout the class, but most of the time will be devoted to hands on torch-time for the student. Class size: 2-4 people to allow ample individual training and hands on torch time. This two-day class, with 4 hours each session, will teach students to build on the skills they learned in Beginning Beadmaking. Students will learn more advanced bead shapes and explore various surface decoration techniques such as clear encasing and sculpture bead work. There will be demonstrations throughout the class, but most time will be devoted to hands on torch time for the student. This two-day course, with 4 hours each session, is designed to hone skills learn beginning and intermediate beadmaking and learn new techniques. Successful graduates of this course are eligible to work independently at Area 253. This class is a one on one glassblowing session with the instructor. Class size: 3 people. If you don't have 3, class is subject to openings on the calendar. Many people, after the loss of a loved one, don't know what to do with their ashes. We work with you to fashion these precious cremains (whether human or animal) into a beautiful vessel for the ashes to be kept in, or a one-of-a-kind glass art piece. Early Morning and Evening Hours may be requested by appointment only.